This amazing idea will enchant travellers and make their trip all that more comfortable and enjoyable. The neck pillow is manufactured from 190T polyester which is a soft material. 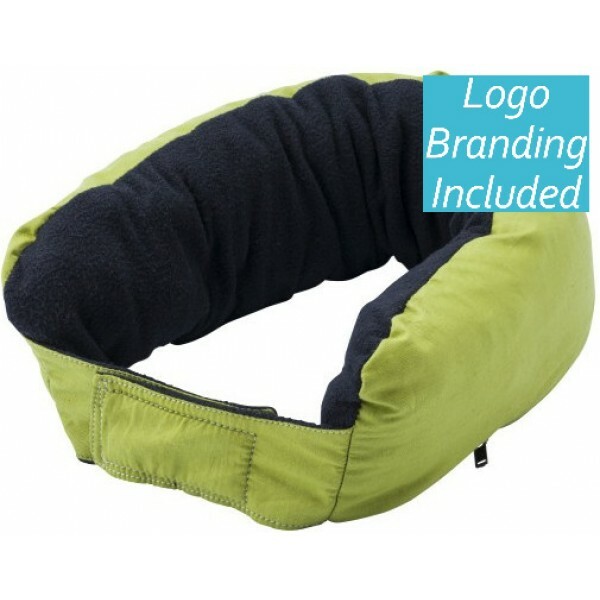 The design offers a long padded body that wraps around into a circle and closes securely with a Velcro closure. Open the Velcro and wrap it around your neck, you will have a comfortable pillow to use on the plane, on a train or on a long car trip. When opened and unrolled, the pillow turns into a large fleecy blanket that you can use to keep warm. By folding the blanket, it becomes a shawl to slip over your shoulders. Choose from a selection of red, pale blue or pale green all with a black interior to match your corporate logo and graphics. This innovative product makes a fabulous giveaway for travel related businesses, airlines, camping and outdoor companies. Offer your clients a product that they will be thrilled to use. We brand these pillows with silk printing or transfer printing to showcase your unique images. The listed price includes branding of your logo in a single colour. Prices exclude GST. A once off set up charge of $75 applies. We offer a fast turnaround of 2 weeks from approval of artwork. We ship to all urban and rural areas within Australia. Silk printing (front only): Max. printing size (w x h): 100mm x 50mm Max. number of printing colours: 2.